You'd probably guess that the guy who first started using religious tracts would be some Calvinist preacher, like Charles Spurgeon or somebody. Well, the other day I ran across a short biography of St. Francis de Sales. I've always been a little curious about this guy since my aunt's church is dedicated to him (not a bad looking sanctuary for a small western Kentucky town either), but I never bothered to look him up or anything. Turns out this is the guy who was sent by his bishop in 1594 to evangelize the Catholic faith in the Calvinist towns of Switzerland, where celebrating Mass warranted death (not unlike the first centuries of the Church). Having stones thrown at you and suffering hypothermia in a tree to avoid becoming dinner for a pack of wolves makes for a thankless job. Since people were afraid to open their doors when he came knockin', he started writing short sermons, having them copied many times over, and sliding them in under the door. Eventually about 70,000 Calvinists returned to the Catholic Church within Francis de Sales' lifetime. 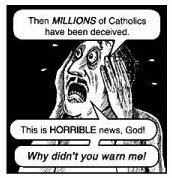 Seriously, you can purchase these tracts in a single bound edition entitled "The Catholic Controversy" for only $9.75 from Amazon.com. Here's one tract I found online called The True Church is Visible. And here's some more about his life: either the short version or the long version. :) His Introduction to the Devout Life was written for laypeople to help them grow in love of God while trying to handle a job and family, which I'm gonna have to add to my lengthy Amazon wish list. Thanks for visiting my blog and using the logo. Welcome to the Catholic faith. My prayers are with you.